YOU AGREE TO ALL THESE TERMS. 1. Buyer's premium is 15% for weekly auctions or 20% for Catalog, Waverly & Collector's series Auctions. An additional 4% premium is added when paying with a credit card or debit card. Purchases must be removed by noon Saturday following the auction. Items not removed by the Saturday after the auction subject to transfer to Quinn's storage facility in Ashburn, VA with additional moving and storage fees. Quinn's assumes no liability for items damaged in transfer. You still agree to pay for all items damaged in transit to our off site facility! 1A. Full payment: All items must be paid for in full before the bidder leaves the premises. Nothing may be removed until bidder transaction is settled. Payment for purchases must be made by cash, cashier's check, or credit card (Visa or Master Card only) or by personal check or business check if approved by auctioneers. Auctioneers reserve the right to hold personal or business checks for up to 10 business days to allow for clearance of funds, returned checks are subject to an additional fee of $35.00. All sales are subject to state sales tax laws. Tax exempt bidder must present proof of sales tax exemption status including a Virginia or reciprocating state tax ID # before any sales tax is waived. Bidder agrees not to stop payment on checks or disallow a sight draft. Bidder is responsible for any expense due to collection of a bad check and authorizes the auctioneer to charge his/her credit card for any merchandise and applicable fees on returned checks. The Auctioneers reserve the right to repossess, at any time, at your location, any unpaid merchandise. The bidder agrees to allow the auctioneer to charge his or her credit card for all unpaid merchandise. The auctioneer reserves the right to bar bidders in participating in future auctions due to failure to pay for merchandise won at auction. 2. No warranty: All items are sold as is, where is, without guarantee of any kind. The descriptions of items appearing in advertising prior to this auction are believed to be correct, nevertheless, neither those descriptions nor any oral statements made by the Owner (or his agents or officers) or the Auctioneer (or his agents or officers) concerning any item shall be construed as a warranty either expressed or implied. I, the Bidder, have examined this merchandise and accept it the way it is. 3. Disputes: The Auctioneer shall designate the winning bidder after each item is auctioned. If disputes arise between two or more bidders, the auctioneer reserves the right to re-open the bidding. The Auctioneer's designation of a buyer shall be final. responsibility of the buyer and the buyer assumes all risk of loss and damage. Buyers should pay for, guard and remove and remove their item(s) accordingly. 5. Injury or damage: Bidder acknowledges responsibility for any personal injury or property damage caused by the Bidder or his agent, and further agrees to hold Auctioneers harmless from any personal injury to himself or his Agents and the property damage incurred on auction premises. 6. Agents only: The Auctioneers are acting as the Owners Agents only. 7. Buyer's premium: A fee of 18% for Catalog, Specialty Sale and Waverly Auctions or a 15% fee for General Auctions will be added to the hammer price. An additional buyers premium of 4% is added to all purchases paid for by credit or debit card. 8. Removal: Removal of items won at auction is the responsibility of the buyer. Prompt removal must be made no later than the Saturday after an auction which is the designated removal deadline. Failure to remove merchandise on the designated day after the auction will incur storage fees of $3.00 per lot, per day. Auctioneer is held harmless for any damage to property incurred during relocation. A $25 relocation fee per item will be added for items moved off site for storage. 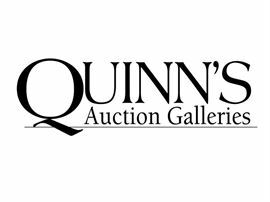 Quinn's staff assisting customers with moving auction purchases to vehicles are not responsible for damage. Weekly Auctions offer a variety of items including art, furniture, collectibles and more. Bidding usually starts at $10. Visit our gallery at 360 South Washington Street, Falls Church Tuesday 4pm-7pm and Wednesday 10am-6pm to preview this week's items or visit our website at www.quinnsauction.com to view the catalog online.